I am getting tired of replacing my front tires because of alignment problems on my 99 zq8 s10 so I was thinking that maybe it would be a good idea to replace the front end suspension and steering. Right now my truck is sitting in my garage because both front tires are worn down to the belts on the inside edges. An alignment was just done in Oct and the center link was just replaced as well. Seems like about once a year I am having some issue with bad tire wear but I normally catch it before it gets too bad, this time I was not so lucky. The last couple of times I drove it I have been noticing bad vibrations at higher speeds in the steering wheel so I figured it was just a balance issue or maybe low tire pressure and never really gave it much thought. I also had a **** of a time trying to control the truck after about an inch of snow on the highway when I changed lanes. It either wanted to force me into the new lane or pull me back into the old lane. I put air in all of the tires and notice the front drivers was low so I figured that would fix my problems. Drove it a few times since and noticed the vibration was better but didn't get a chance to see if it was still wanting to pull me across lanes when I changed lanes. The last time I drove it I backed it out of my garage and turned the steering well before I got out of my truck to shut my garage door. When I walked back to my truck I noticed the wear on the tires and promptly put it back in the garage and took my wife's car instead. Right now I am in the planning stage of figuring out what to buy without having to pull everything apart. I would like to go with all Moog if possible but I am just not sure what I should look at replacing. Right now my plans are is loaded upper and lower control arms, inner and outer tie rods, center link (maybe), idler arm, sway bar bushings and end links. I also will be needing new brakes as well soon so I was planning on upgrading the rotors and calipers. Since I would already be taking a lot of stuff apart would there be anything else that might be beneficial to change? Other then what I listed above I don't think anything has been changed on the front end of my truck so would maybe new springs other components be helpful as well? The truck has about 250K on and the shocks were changed about 2 years ago. What Is your current suspension setup? stock? Bagged? Lowering springs? Lifted? Shackles and hockey pucks? Cut springs? Sounds like you need a better alignment shop or don't buy Chinese tires? Never heard of any stock S10 having such bad tire wear issues in a single year. Are these like, used tires you're buying? Did an actual shop do the alignment or did you? You should investigate the actual cause of the alignment problem and fix that first. Otherwise, sure, rockauto and other websites sell all the parts you need. 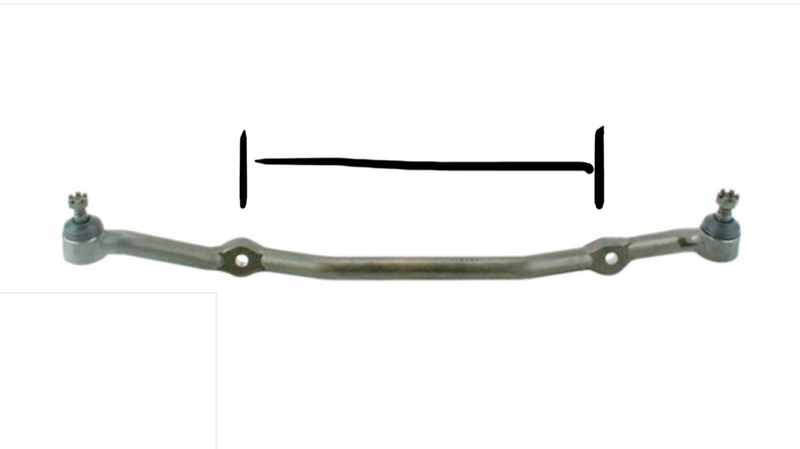 Keep in mind there's very little difference in replacement parts, an end link from NAPA, CARQUEST, etc. will be the same as, and may even be moog. The only parts to watch out for and not buy is the ebay stuff. There is no easy upgrade for S10 rotors and calipers unless you swap to blazer spindles which accept the blazer 2 piston calipers. Used blazer spindles are relatively cheap at most wrecking/parts yards. Downside is they use a unitized wheel bearing hub which neither lasts as long, nor is as cheap, as inner/outer bearings on the S10 style spindle. The last place that did the alignment is a tire place and was when I switched from summer to winter tires. The winter tires are on their third season and still pretty much looked new until recently. They did provide a before and after snapshot of the alignment but I don't remember what it was or if I still have it. I feel like my new issue is more due to the road outside my house that is nothing but potholes. I have to pick and choose the least dangerous ones as I drive since I can't avoid them all. Only other thing I can think of that can cause the problem is low tire pressure for my current tires but I don't think that would wear just be on the inside of both front tires when only the driver side was low. I never had a suspension/steering problem until about 10 years ago when I took it to a shop and they said everything needed to be replaced so I said go ahead and do it. Didn't know any better then. Now it seems like about every two to three years I am replacing the front end for similar wear problems that were fixed by different shops and they always want to replace everything. The last anything was done was to just replace the passenger side suspension for a tire wear problem. I am still using that tire today as one of my summer tires since I was able to catch it early enough. Other than that, when I got my last state inspection done, they said the center link needed to be replaced and so they did and when they "looked" up the info they told me it didn't require an alignment. Not sure if that is what is causing my problem now. Only other issue I can think of right now that I have as well is that when I brake hard on the highway it likes to pull to either side hard. Supposed to warm up here this weekend so I should be able to get my truck up on jack stands to see if I can find anything wrong. Basically what I am ready to do is get rid of the cheap stuff that repair shops are using and install what I hope to be a better quality part. Could a problem with my frame cause issues as well. It has been in a few accidents. One of which was when it got hit it on the passenger's side rear quarter panel while it was parked. The entire rear end of the truck slid over a parking space but the body shop said the frame was fine. I am not so sure because there is a difference in the gap on each side of the truck between the bed and the cab. Yes if you replace your center link you absolutely must do an alignment. I bet you’re toe is WAY off. I’m also in southern nh and I feel your pain with the endless potholes and horrible frost heaves. Unless the distance between these holes is identical between every part, (and it almost never is) that’s going to throw your toe off considerably. I live on a private road which isn't maintained by the city and I have no idea who owns it the road. I rent the house I am in and the rest of the houses on this road are million dollar houses. It seems like the more money someone has the cheaper they are. The owner of my house lives on this road but he pretty much refuses to fix anything. I am trying to buy a house right now and have an offer in on one but just found out that their realtor asked my realtor if we could wait one more day to see if they get any more offers, my offer has been in for three days already. If you are sitting on dry,level pavement(parking lot)- turn the wheel slowly from lock to lock with your windows down and listen carefully- squeaking or clunking noises will tell you if your ball joints are shot.Next, look at the bushings on your upper control arms for cracking and shiney metal.Third- once you put it up on jack stands- grab both sides of tire and wiggle it- should NOT move -pull/push -still should not move. gently turn the wheel and listen look for suspension parts that jerk or flop. Inner edge wear like you are descibing on BOTH wheels can be tricky as ball joints do not usually croak in even pairs, but it does happen. I could see it being more of an alignment problem in regards to the toe. The last time I drove it in snow it almost felt like my front tires were fighting each for which direction to go but that didn't really seem possible at the time but if the toe is the issue because of the center link being replaced I could see that then. Or maybe I am just lucky and everything wants to go bad all at once. You have to be careful who you deal with when it comes to getting alignments done. A lot of place do pretend alignments. There's also the places with all the young guns that haven't even seen the suspension on an S10 or any other old GM stuff in their lives......which is most shops these days. I like to try to find mom&pop shops that have cool stuff parked in their lots on occasion. Jaboc33 and thebadwrench like this. My 2002 was wearing tires on the inside edges. Center link and idler arm were worn. replaced and aligned. Toe was off. Just rotated my tires @10,000 miles with no wear that I could tell. I have never been one to throw a bunch of parts at the front end unless they are all worn out. My 1992 still has one of the original upper ball joints @357k. 1992 rcsb 4.3,at 357,000 miles. FOR SALE PM Me!